A lot of things came together at the right time that all seemed to speak directly to me to make Tarzan one of my favorite Disney films. First, I used to watch the old Johnny Weissmuller movies of the 30s & 40s when I was a kid. We’d borrow them on VHS from the library and watch him save Jane from crocodiles and pythons over and over again. Second, my dad is a big Phil Collins fan, not a follower of Genesis really, but more his adult contemporary solo career. So I grew up watching Tarzan movies, listening to Another Day in Paradise, and then I fell in love with Minnie Driver. So you can see, as I was already a huge fan of Disney animated musicals, why this one would be right up my alley. It’s a classic tale given a new voice & energy in Disney’s 1999 version that took the world by storm. We begin with a family shipwrecked on the African coast, building a new life for themselves, and ultimately losing their struggle against the nature of a land they didn’t belong to. However, the baby of the family survived, found by a lonely ape named Kala who had lost her own child, raised by a new family that adopted him despite his differences. Now Tarzan, as his new mother calls him, is a full-grown man, a member of the ape group, and an intelligent jungle creature. 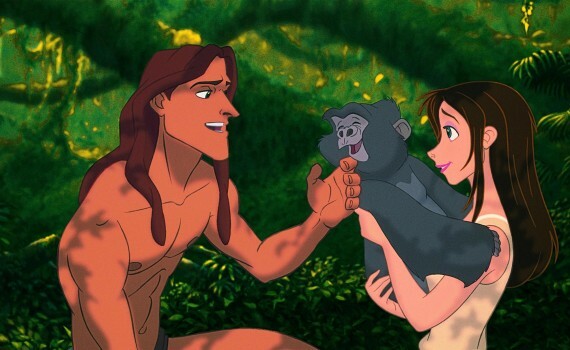 One day, after protecting his friend Terk and perhaps finally earning the respect of the alpha male, Kerchak, Tarzan discovers a band of humans walking through the trees. He’s confused as to why these animals look so much like him, and he begins to discover their world with the help of the beautiful Jane and her father Professor Porter. But the hunter, Clayton, has other interests beside knowledge, and will begin to enact a plan that will change all their lives forever. Let’s say that all those elements that drew me to the film in the first place had failed. Let’s say that all the great pieces were there, but that they didn’t come together in the way that I hoped they would. I would have been crushed I guess, but thankfully that couldn’t be further from reality. Every little part of the film worked, from the excellent animation to the classic characters. The story was there already; you can’t give Disney too much credit for that. But they brought it to life in a unique & wonderful way. The voices were spot on, with Minnie Driver as Jane, Rosie O’Donnell as Terk, Lance Henrikson as Kerchak. And the music, wow, I have & could listen to that soundtrack all day. Phil Collins was the perfect choice and brought a fresh non-ballad, non-musical feel to the film that fit the plot. Can you imagine Jane singing a pop love song and becoming just another Disney princess? That would have been a fatal flaw, but was avoided beautifully. Tarzan is one of the best “modern” Disney films, capping off a run of huge successes from the 90s and standing alone as an original hit.